city limits so records of residents would not have been included in the Columbus City Directory. There is a listing for a “John Brown” residing on Cleveland Ave between North Public Lane (Naughten Street) and Spring Street in the 1858-59 city directory. This would have been just a couple of blocks from St. Patrick’s in the Irish section of town. 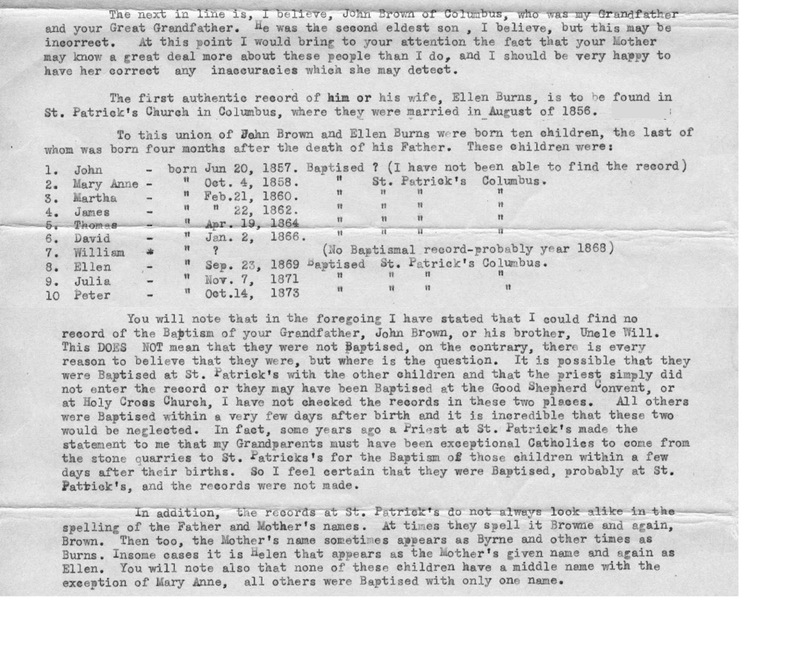 However, it is far from certain that this is the same family since Peter Burns is not listed separately in the directory, and these two families always lived in very close proximity. Could it be that Peter and John were living in the same household and only one name was recorded? Southwest portion of Perry Twp. to John Brown. Both men are identified as laborers. Because neither of them owned land, it is difficult to exactly pinpoint them on a map. 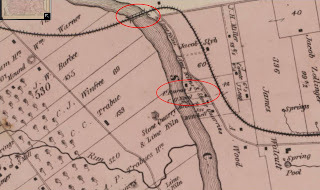 However, other individuals enumerated within a couple of pages of them in the census do own land and can be identified on an 1872 map of Perry Township.4 (See Perry Township map left) From this information we can identify an area in the southern most portion of Perry Township, bordering Franklin Township, where both John Brown and Peter Burns were living in 1860.
children. John Gray is a border. Julia, the mother of Ellen and Martha, is living with Peter and Martha. 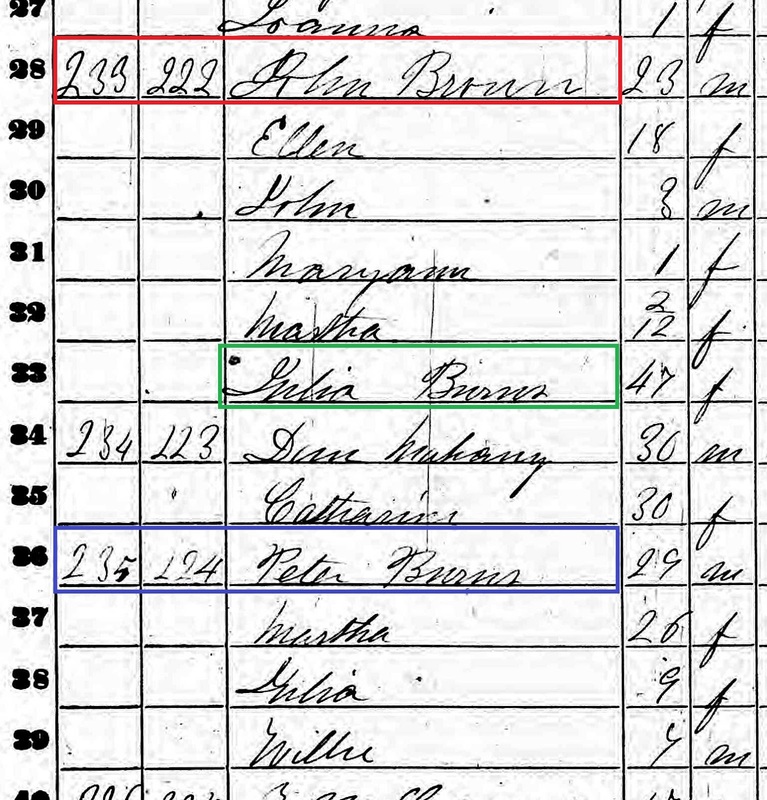 (The census suggests Julia’s last name is “Tracy” when the name is actually Julia Burns. 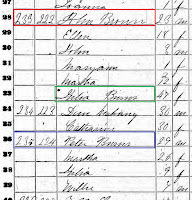 This can be verified later in the 1880 census.) No children are listed with Peter and Martha. 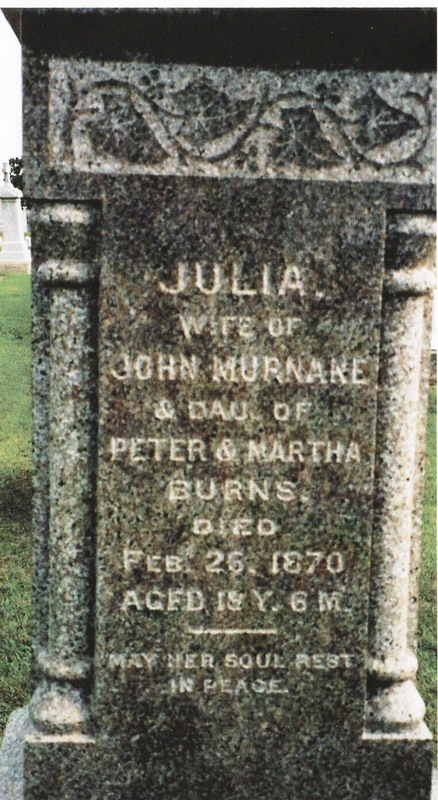 Their oldest child, Julia, shown in the 1860 census, married John Murnane on October 1, 1869. (Remember this surname. We will see it again later.) Julia died just four months later on February 26, 1870 of “intermitting fever” and is buried in Mr. Calvary Cemetery in Columbus, Ohio.6 Nothing more is known of their other child, Willie. Northeast section of Franklin Twp. to settle debts of the estate11. 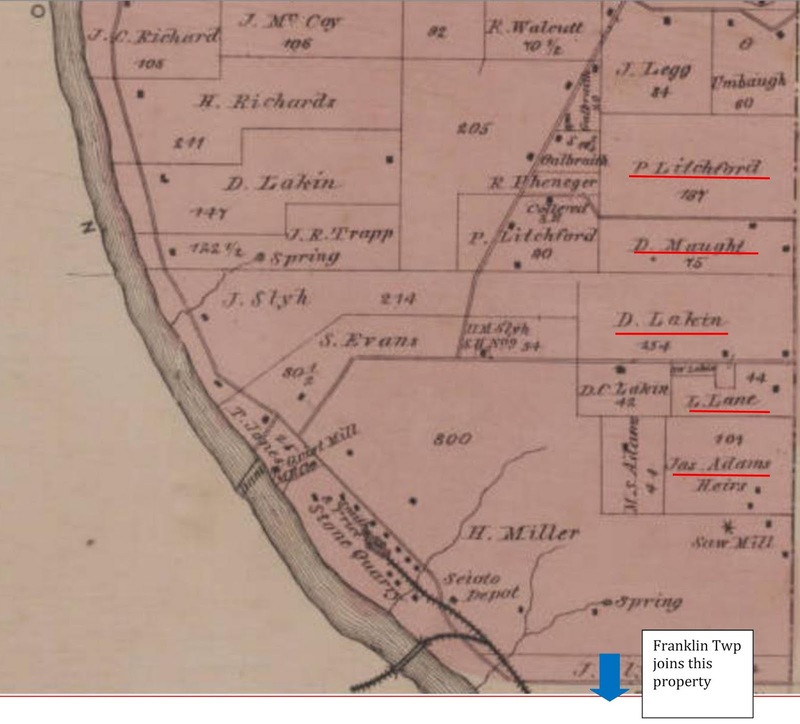 The property is described as “lots seven and eight in original lot fifty-nine in William Phelan’s Mount Pleasant Addition in the city of Columbus, E. Sorins subdivision.” A map of the area, (see left), shows the location. The vacant lots were purchased for $160 by John Brown from Edward Sorin on August 8, 1864 and are located in Montgomery Township at the corner of Third Avenue and Sixth Street. 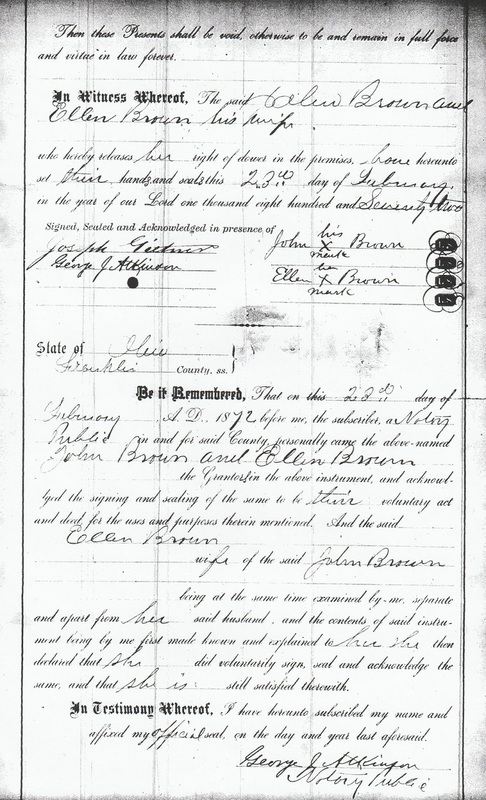 On August 26, 1865, Peter Burns also purchased property from Edward Sorin. He purchased lots eight, nine, ten and eleven in original lots twenty-eight, twenty-nine, and thirty also in William Phelan’s Mount Pleasant Addition for $400.12 These properties would have been in very close proximity to the lots purchased by John Brown just a year earlier. I do not know whether the lots were purchased with the intent to build their homes there, or, whether they were intended as a business venture; perhaps both since each man purchased multiple lots. 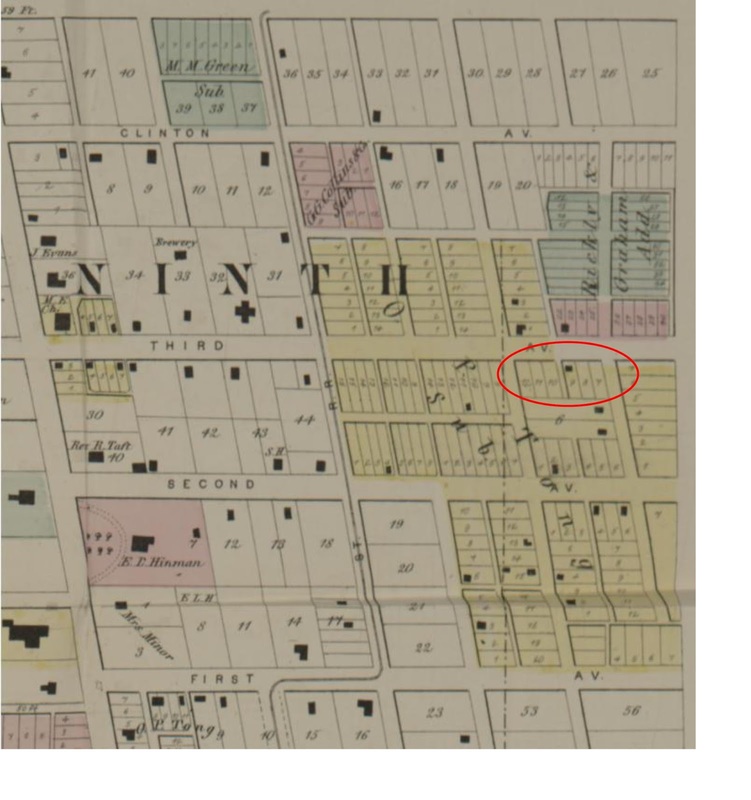 Whatever the reason, Peter sold his city lots to Catharine Ryan on August 30, 1871 for a nice profit, receiving $1,400 for the property.13 By this time, Peter had purchased the quarry property (1869) and, according to the 1870 census (see above) was living at the quarry, probably with John Brown and his family. Trains provided an important function in the late 1800s and were the main source of transportation at the time even for short distances. The Redfield & Logan’s Columbus & Indianapolis Central Railway Business Guide17 gives information for a train line (the Columbus Chicago and Indiana Central division of the Pan-Handle Railroad) running from the station on North High Street at Naughten Street going north and west to a flag station at “Scioto” four miles from the city near where the Brown and Burns families were living. The track runs east of Dublin Road and crosses the Scioto River just north of Fifth Avenue and, actually could have been used in the quarry business. The tracks still exist today. (Refer to the earlier images of Franklin and Perry Townships for location of the tracks.) Ease of transportation is probably the reason all of the children were baptized at St. Patrick’s. It would have been a ten minute ride to downtown Columbus. Remember St. Patrick’s is located just a few blocks east of the site of the train station on Naughten Street. In the next post, we will look at the aftermath of the accident and what happened to Ellen and the children. This post was written with the able assistance of Marion. 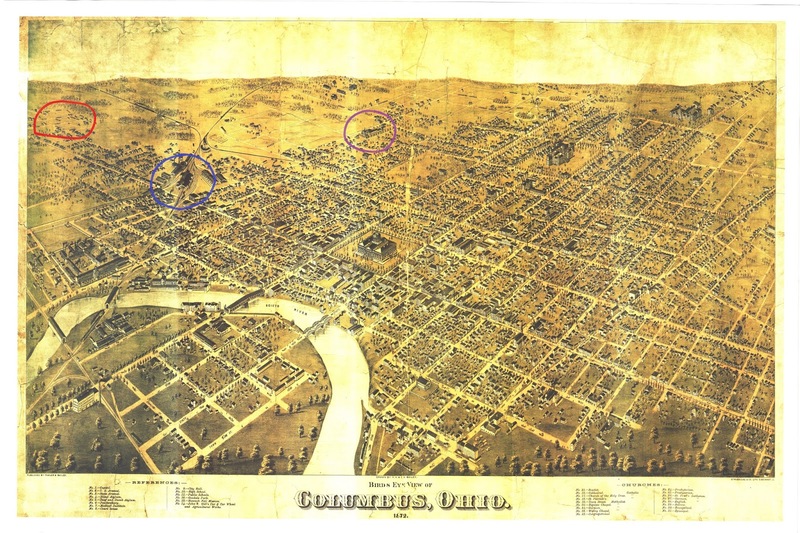 1872 Birds-eye View of Columbus, Ohio. 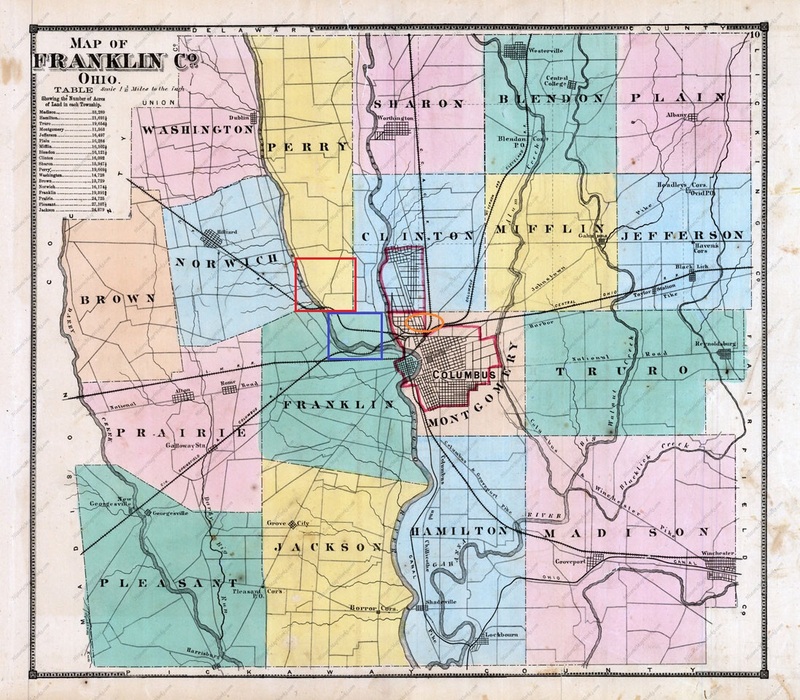 Map used with permission of the The Columbus Metropolitan Library Image Collections. Detailed map in high resolution allows view of specific Columbus locations in 1872. The blue circle shows the train station. The purple circle shows St. Patrick’s Church. 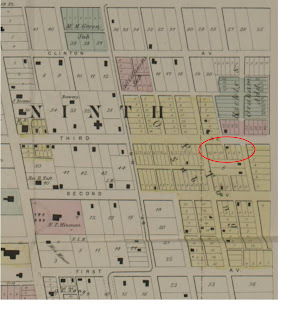 The red circle shows the city lots purchased by John Brown in 1864. Zoom in to see details. Street names have changed since the map was created. They are listed in the 1874 edition of the Columbus City Directory. Clinton is now Fourth St.; East is now Sixth St.; Eastern is now Fifth St.; Phelan is now Fourth St.
2. 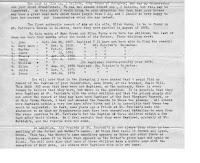 Brown, David, Kewanee, IL 11 May 1943, Letter to Esther _________, Columbus, OH. 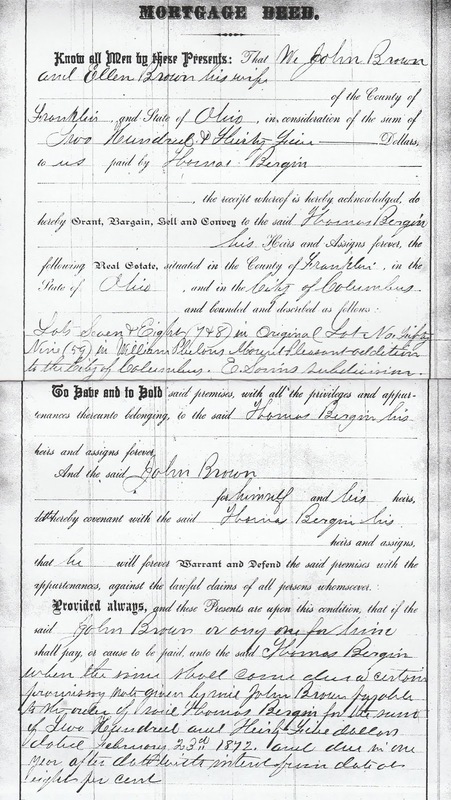 Verification of the baptisms at St. Patrick’s church, Columbus, Ohio, were obtained for all of the children through the Catholic Record Society, Diocese of Columbus, Columbus, OH - Mary Ann baptized 7 Nov 1858; Martha baptized 10 Mar 1860; James baptized 12 Mar 1862; Thomas baptized 7 May 1864; David baptized 10 Jan 1866; Ellen baptized 16 Oct 1869; Julia baptized 31 Nov 1871; Peter baptized 6 Dec 1873. Note that records do not exist anywhere in the Columbus Diocese for John E, the oldest son, and William Henry, the seventh child. Since this family made a special trip to St. Patrick’s for the other baptisms, like David Brown, I assume John and William were also baptized at St. Patrick’s and the event was just not recorded. 10. Franklin County, Ohio, probate case files, estate no. 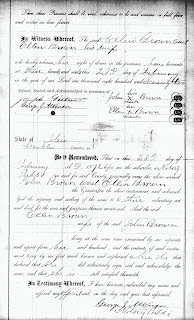 010060, John Brown (1878), Notice of Sale, 2 Oct 1879, Probate Court, Ohio Historical Society, Columbus, Ohio. 11. 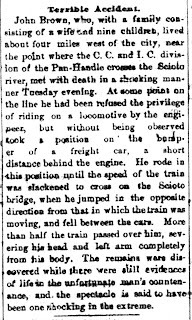 Franklin County, OH, Deed Book 140, Page 491. 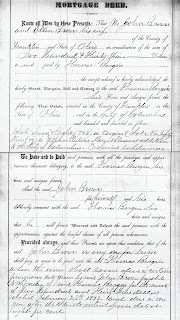 Sale of real estate from the estate of John Brown to Thomas Bergin, 3 Oct 1879. 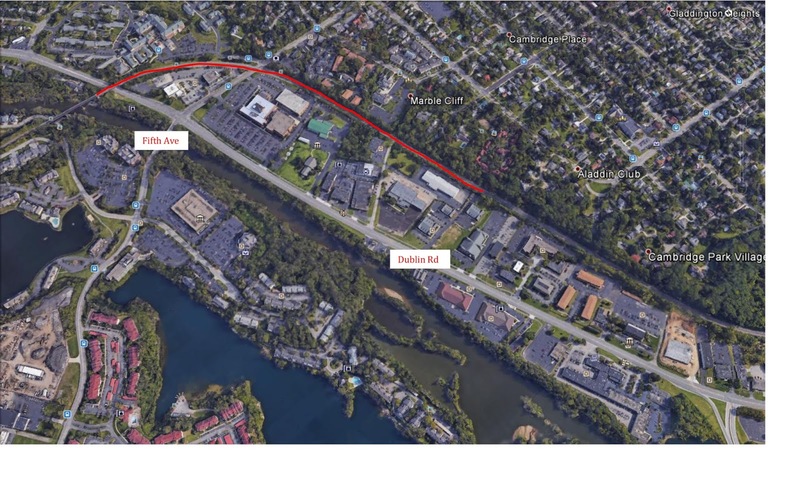 William Phelan was a large land owner in Franklin County including the Mount Pleasant Addition in the north side of Columbus. The property was divided into large lots and sold to individuals who further subdivided them into city lots. Edward Sorin purchased many lots from Phelan. 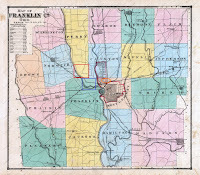 A map is available online at the Columbus Metropolitan Library (1899 Baists Property Atlans of the City of Columbus - http://digital-collections.columbuslibrary.org/cdm/compoundobject/collection/maps/id/59/rec/2 [section 14]) that shows the lots purchased by “E. Sorin” which were further subdivided. 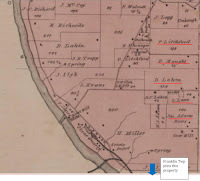 To identify the exact location of the city lots owned by John Brown, I followed sales of the property until it could be identified on a current tax map. In Columbus, numbered avenues run east and west; numbered streets run north and south. 13. Franklin County, Ohio, Deed Book 106, page 107. Sale of lots 8, 9, 10, and 11 in original lots twenty-eight, twenty-nine, and thirty from Peter Burns to Catharine Ryan for $1,400. 14. Franklin County, Ohio, probate case files, op.cit. Mortgage Deed dated 23 Feb 1872. 15. 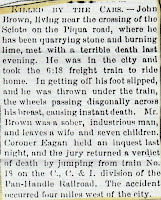 "Ohio, County Death Records, 1840-2001," database with images, FamilySearch (https://familysearch.org/ark:/61903/1:1:F6JV-BWL : 13 December 2014), Jule Brown, 24 Jan 1873; citing Death, Franklin Township, Franklin, Ohio, United States, source ID v 1 p 63, County courthouses, Ohio; FHL microfilm 285,206. 16. Information from Catholic Cemeteries, Columbus, Ohio. Few early records for the cemetery were kept. 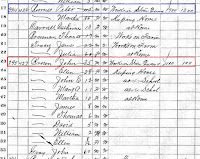 Information is from a ledger available at the office of St. Joseph Cemetery, Lockbourne, Ohio. 18. 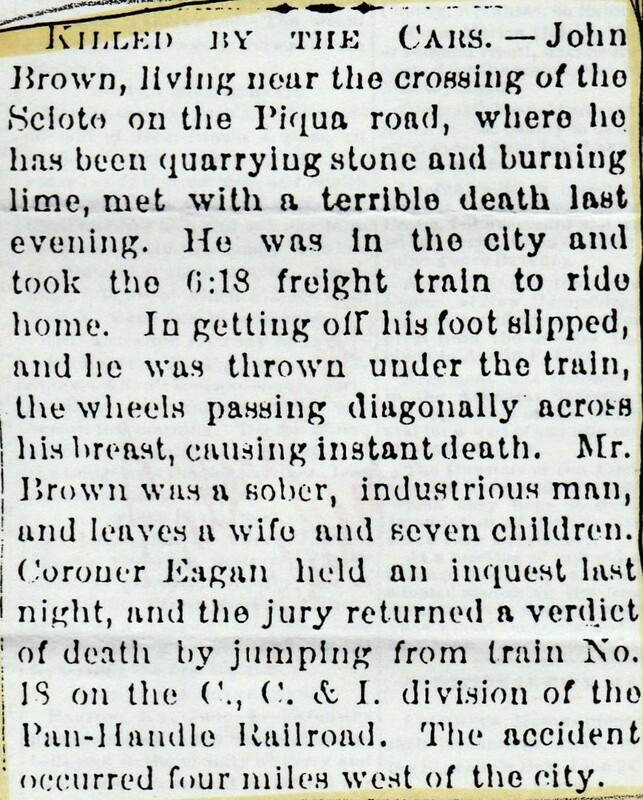 "Ohio, County Death Records, 1840-2001," database with images, FamilySearch (https://familysearch.org/ark:/61903/1:1:F6JV-1PY : 13 December 2014), John Brown, 03 Jan 1873; citing Death, Franklin Township, Franklin, Ohio, United States, source ID v 1 p 71, County courthouses, Ohio; FHL microfilm 285,206. 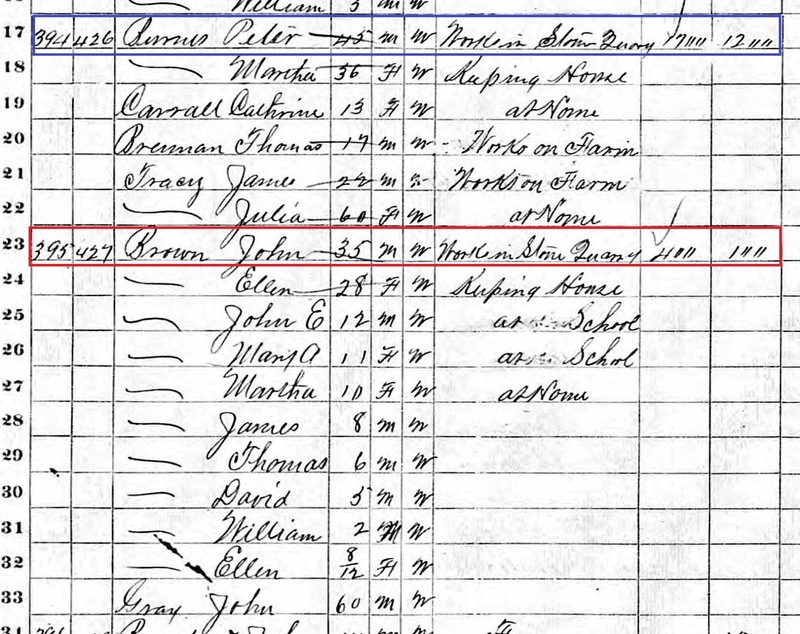 Death Register shows death as January 3, 1873. 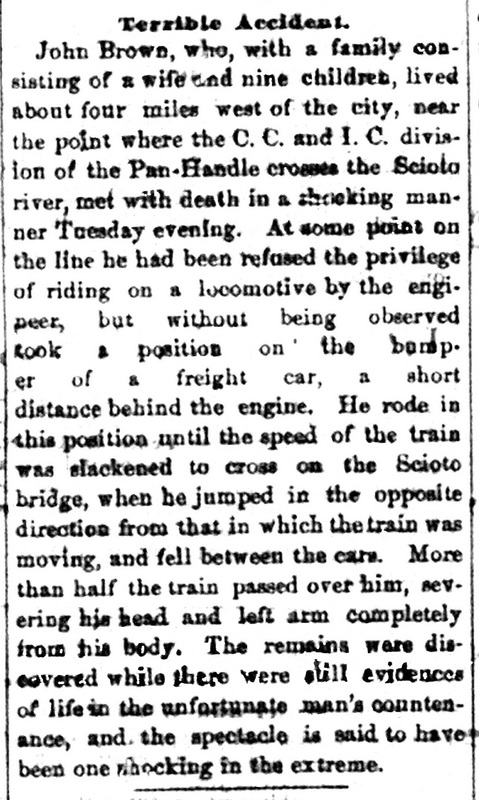 The date, from news clippings, is actually June 3, 1873.